My love for baking my kids snacks can’t be rated. I feel that every Mom should endeavour to make their kids snacks, majorly school snacks. Homemade snacks is the best as far as I am concern, [case study] – i was giving my kids store bought juice. My LO was consistently Stooling, I was administering drugs but it couldn’t stop but was managed. Not until one day I just said to myself no more proccessd juice and biscuits and other snacks, prior to when i made the decision i was baking occasionally. 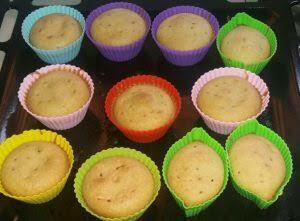 This muffin that am sharing the recipe below is good for the kids. Store bought ain’t bad, but let’s face it you can’t vouch for the ingredients used, it’s source, the hygiene factor nor how healthy it is for kids. Immediately I stopped packing juice in their lunch box, the stooling stopped till date. why am I saying this, is just to encourage parents especially Moms to try as much as possible to bake the kids snacks. Its benefits are awesome, you can tweak it, reduce quantity of sugar, use oats or other healthy flour instead of all purpose flour, use cholesterol free vegetable oil in place of margarine or butter. Add the vegetable oil and in a mixing bowl, whip very well until fluffy, add in egg and whip. if you are using a mixer to mix do not mix on high speed and do not mix for long time, 5-10 Mins is ok.
Sieve in the flour and baking powder together in a mixing bowl, add salt milk and vanilla and mix until it’s well mix. Bake at 150° for 30-35 mins or until its done, you can use the toothpick checking method. Did you make it?, can you share your thoughts!! !